This article is about the electromagnetic phenomenon. The Earth, with its magnetic field, is approximately a magnetic dipole. However, the "N" and "S" (north and south) poles are labeled geographically, which is the opposite of the convention for labeling the poles of a magnetic dipole moment. In physics, there are two kinds of dipoles (from the Greek terms di(s)-, meaning "two," and polos, meaning "pivot" or "hinge"): An electric dipole and a magnetic dipole. An electric dipole refers to an object or system in which positive and negative electric charges are located at two separate points. The simplest example is a pair of electric charges of equal magnitude but opposite sign, separated by some small distance. A permanent electric dipole is called an electret. Contour plot of an electrical dipole, with equipotential surfaces indicated. 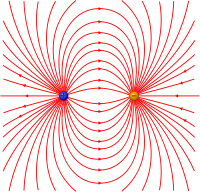 A magnetic dipole is an object or system in which opposite magnetic poles (north and south) are separated by a distance. A magnetic dipole is produced by a closed circuit of electric current. A simple example of this is a single loop of wire with some constant current flowing through it. A dipole can be characterized by its dipole moment, a vector quantity. For the simple electric dipole mentioned above, the electric dipole moment points from the negative charge towards the positive charge, and its magnitude is equal to the strength of one of the charges multiplied by the separation between the charges. For a magnetic dipole, the magnetic dipole moment is the strength of either magnetic pole multiplied by the distance separating the two poles. For a magnetic dipole produced by a current loop, its dipole moment points through the loop (according to the right hand grip rule), and its magnitude is equal to the current in the loop times the area of the loop. In addition to current loops, the electron, among other fundamental particles, is said to have a magnetic dipole moment. This is because it generates a magnetic field which is identical to that generated by a very small current loop. However, to the best of our knowledge, the electron's magnetic moment is not due to a current loop, but is instead an intrinsic property of the electron. It is also possible that the electron has an electric dipole moment, although this has not yet been observed. Real-time evolution of the electric field of an oscillating electric dipole. The dipole is located at (60,60) in the graph, oscillating at 1 rad/s (~.16Hz) in the vertical direction. A physical dipole consists of two equal and opposite point charges: Literally, two poles. Its field at large distances (that is, distances large in comparison to the separation of the poles) depends almost entirely on the dipole moment as defined above. A point (electric) dipole is the limit obtained by letting the separation tend to 0 while keeping the dipole moment fixed. The field of a point dipole has a particularly simple form, and the order-1 term in the multipole expansion is precisely the point dipole field. Any configuration of charges or currents has a "dipole moment," which describes the dipole whose field is the best approximation, at large distances, to that of the given configuration. This is simply one term in the multipole expansion; when the charge ("monopole moment") is 0—as it always is for the magnetic case, since there are no magnetic monopoles—the dipole term is the dominant one at large distances: its field falls off in proportion to , as compared to for the next (quadrupole) term and higher powers of for higher terms, or for the monopole term. A molecule with a permanent dipole moment is called a polar molecule. A molecule is polarized when it carries an induced dipole. The physical chemist Peter J.W. Debye was the first scientist to study molecular dipoles extensively, and dipole moments are consequently measured in units named debye in his honor. Induced dipoles: These occur when one molecule with a permanent dipole repels another molecule's electrons, "inducing" a dipole moment in that molecule. See induced-dipole attraction. The definition of an induced dipole given in the previous sentence is too restrictive and misleading. An induced dipole of any polarizable charge distribution (remember that a molecule has a charge distribution) is caused by an electric field external to . This field may, for instance, originate from an ion or polar molecule in the vicinity of or may be macroscopic (for example, a molecule between the plates of a charged capacitor). The size of the induced dipole is equal to the product of the strength of the external field and the dipole polarizability of . These values can be obtained from measurement of the dielectric constant. When the symmetry of a molecule cancels out a net dipole moment, the value is set at 0. The highest dipole moments are in the range of 10 to 11. From the dipole moment information can be deduced about the molecular geometry of the molecule. For example, the data illustrate that carbon dioxide is a linear molecule but ozone is not. μ0 is the permeability of free space, measured in henrys per meter. where E is the electric field and is the 3-dimensional delta function. ( = 0 except at r = (0,0,0), so this term is ignored in multipole expansion.) 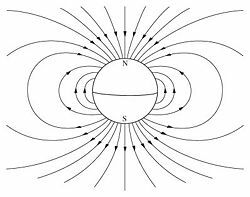 Notice that this is formally identical to the magnetic field of a point magnetic dipole; only a few names have changed. In the case of open-shell atoms with degenerate energy levels, one could define a dipole moment by the aid of the first-order Stark effect. This only gives a non-vanishing dipole (by definition proportional to a non-vanishing first-order Stark shift) if some of the wavefunctions belonging to the degenerate energies have opposite parity; that is, have different behavior under inversion. This is a rare occurrence, but happens for the excited H-atom, where 2s and 2p states are "accidentally" degenerate (see this article for the origin of this degeneracy) and have opposite parity (2s is even and 2p is odd). ↑ David J. Griffiths, Introduction to Electrodynamics, 3rd edition (Upper Saddle River, NJ: Prentice Hall, 1999, ISBN 013805326X). ↑ Charles A. Brau, Modern Problems in Classical Electrodynamics (Oxford: Oxford University Press, 2004, ISBN 0195146654). ↑ Robert C. Weast, CRC Handbook of Chemistry and Physics (Boca Raton, FL: CRC Press., 1984, ISBN 0-8493-0465-2). Bonin, Keith D., and Vitaly V. Kresin. 1997. Electric-Dipole Polarizabilities of Atoms, Molecules and Clusters. River Edge, NJ: World Scientific. ISBN 9810224931. Brau, Charles A. 2004. Modern Problems in Classical Electrodynamics. Oxford: Oxford University Press. ISBN 0195146654. Demaison, J., H. Hübner, W. Hüttner, and J. Vogt. 2002. Dipole Moments, Quadrupole Coupling Constants, Hindered Rotation and Magnetic Interaction Constants of Diamagnetic Molecules. Berlin: Springer. ISBN 3540410376. Gibilisco, Stan. 2005. Electricity Demystified. New York: McGraw-Hill. ISBN 0071439250. Griffiths, David J. 1999. Introduction to Electrodynamics, 3rd edition. Upper Saddle River, NJ: Prentice Hall. ISBN 013805326X. Young, Hugh D., and Roger A. Freedman. 2003. Physics for Scientists and Engineers, 11th edition. San Francisco: Pearson. ISBN 080538684X. Fields of Force: a chapter from an online textbook. 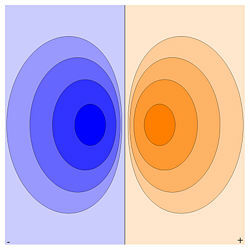 Electric Dipole Potential by Stephen Wolfram and Energy Density of a Magnetic Dipole by Franz Krafft. The Wolfram Demonstrations Project. This page was last modified on 21 October 2017, at 21:43.